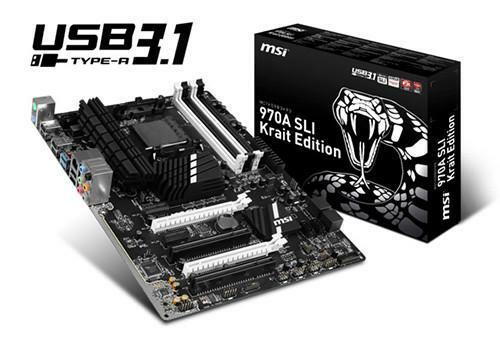 MSI on Wednesday announced a 970A SLI Krait motherboard that will support the AMD processors and the USB 3.1 protocol. Motherboards with USB 3.1 ports have also been released by Gigabyte, ASRock and Asus, but those boards support Intel chips. USB 3.1 can shuffle data between a host device and peripheral at 10Gbps (bits per second), which is two times faster than USB 3.0. USB 3.1 is also generating excitement for the reversible Type-C cable, which is the same on both ends so users don't have to worry about plug orientation. The motherboards with USB 3.1 technology are targeted at high-end desktops. Some enthusiasts like gamers seek the latest and greatest technologies and build desktops with motherboards sold by MSI, Asus and Gigabyte. Many of the new desktop motherboards announced have the Type-C port interface, which is also in recently announced laptops from Apple and Google. New technologies like USB 3.1 usually first appear in high-end laptops and desktops, then make their way down to low-priced PCs, said Dean McCarron, principal analyst of Mercury Research. PC makers are expected to start putting USB 3.1 ports in more laptops and desktops starting later this year. The need for faster access to external storage could make the motherboards with USB 3.1 attractive to enthusiasts, McCarron said. Some storage peripherals with Type-C connectors are becoming available, but can't reach full USB 3.1 speeds yet. However, the data transfer speeds will continue to improve as controllers are refined. Enthusiasts won't buy new motherboards just for USB 3.1, but they'll factor in other reasons like processor upgrades, said Nathan Brookwood, principal analyst at Insight 64. The new MSI 970A SLI Krait motherboard supports the latest AMD CPU and multiple graphics processors. The USB 3.1 ports will just be icing on the cake, Brookwood said. But buyers will have to watch the type of USB 3.1 ports they are getting in the new motherboards. The new MSI motherboard has larger USB 3.1 Type-A ports, which are similar in size to the current USB 3.0 ports in PCs. The larger connectors will ensure existing USB 3.0 and USB 2.0 peripherals plug into desktops, but won't deliver the blazing fast speeds of USB 3.1. McCarron said that most of the peripherals and PCs will come with the Type-C connectors. Cables will become available so PCs with USB 3.1 Type-A connectors can connect to peripherals with Type-C connectors. The price for MSI's 970A SLI Krait motherboard wasn't immediately available.